“I’m not an athlete. I’m a professional baseball player.” That’s right, Phillies great and fan favorite John Kruk is back with the Phillies, now as a broadcaster in the booth. Spring is upon us in Philadelphia, and that means sunshine, warmer weather, Phillies baseball and ice cold brews. Which particular beer? Where is it located? Fear not, Phillies/beer fans, we got you covered. Welcome to our 6th Annual CBP Phillies beer locator! Since there was no exhibition series this season, we worked some magic to get a special, advanced look at this year’s ballpark beers. Here are the biggest things that caught our eye for this 2017 season: lots more craft cans … and way more local and regional craft beer than the last couple seasons — plus full service bars with booze scattered around the ballpark! Yes, you are going to be very, happy this year! Like the last couple years, you’re going to see mega cans (even craft mega cans) and 16-ounce craft cans everywhere and anywhere in 2017. You can expect much more variety than the last couple seasons, and some awesome new beers at the ballpark, featuring local brews and quality craft from around the country. Local Weyerbacher is on draft at CBP for the second year in a row — this season with Mellow Monks, a low-ABV Belgian-style ale. New Belgium Brewing Company is well represented with Voodoo Ranger IPA on draft, 16-ounce Citradelic IPA cans, and new 24-ounce mega cans of Dayblazer golden ale. SweetWater Brewing Company is back for its second year with 16-ounce cans of 420 Extra Pale Ale and Goin’ Coastal Pineapple IPA (which is still kind of new at CBP, as it debuted around the end of last season). Local Conshohocken Brewery’s Puddlers Row ESB is back for a third year and is a great beer for when it’s cooler out. Troegs is still representing the craft can beer movement at CBP with the most powerful punch. Troegs Trogenator weighs in with an aggressive 8.2% ABV. I really enjoy sipping these 16-ounce doppelbock cans a lot during cooler games. I really like the Sly Fox 360 IPA cans. Yes, indeed, these are the cans with the 360 Lid – the entire lid comes off, enhancing your can-drinking experience, and Sly Fox Pilsner will be on draft, too. Dogfish 60 Minute IPA will be on draft for the first time in a long time (if at all) this year. There used to only be bottles in past seasons. Sierra Nevada Tropical Torpedo will be on draft for the first time, too. Victory Vital IPA is a new draft choice at CBP, as well. Local mainstays like Yards, Philadelphia Brewing Co., and Flying Fish will have much more presence than they had in recent years, which I’m very excited to report. Other new additions to the 16-ounce can selection: Kona Longboard Lager, Long Trail Green Blaze IPA, Magic Hat #9, Yuengling Light Lager, Yuengling Black & Tan, and Modelo Especial. And yes indeed, there will be booze available throughout the ballpark now. You’ll be able to sip wine and mixed drinks and bring your beverage to your seat! And yes, they’ll pour doubles, too! In the cold, these are some of my favorites (in alphabetical order): Conshohocken Puddlers Row ESB, Dogfish 60 Minute IPA, Sly Fox 360 IPA (can), Troegs Troegenator (can), Two Roads Lil’ Heaven (can), Victory HopDevil, Weyerbacher Mellow Monks, and Yards Brawler. In the hot summer months, I gravitate towards these brews (in alphabetical order): PBC Walt Wit, Sierra Nevada Tropical Torpedo, Two Roads Lil’ Heaven (can), Weyerbacher Mellow Monks, Yards Philly Pale Ale, and Yards Saison. In the end, beer is a personal choice. 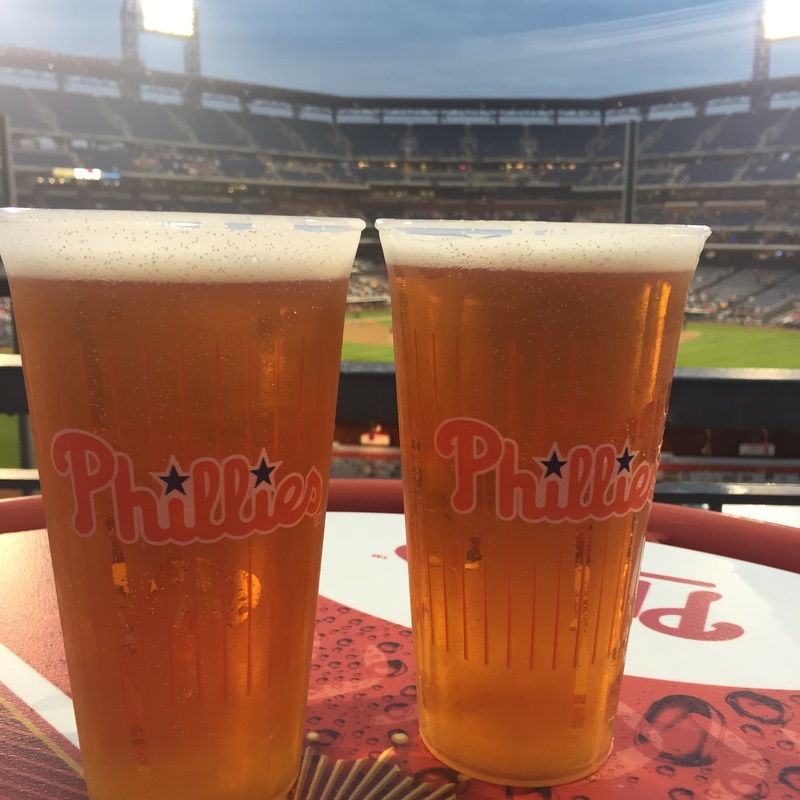 Our annual CBP Beer Locator hopes to facilitate your baseball-beverage enjoyment. We hope you enjoy our hard work and enjoy whatever beer is your personal favorite. We’ll be updating all season long. Here’s to a great 2017 Phillies season! High Hopes!